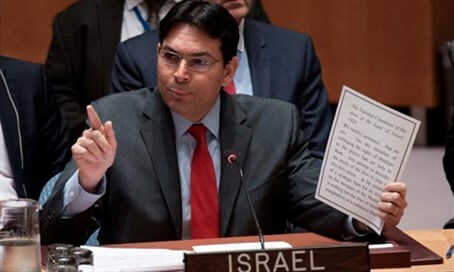 Israel's United Nations Ambassador Danny Danon fiercely criticized the UN Security Council on Tuesday, during a UNSC discussion on the situation in Israel and the wider Middle East. Danon slammed the Security Council for failing to issue a single condemnation following deadly terror attacks against Israeli civilians, accusing it of "hypocrisy." "During the past four months, Israelis have been stabbed in their homes, shot at in the streets, and run over by terrorists using cars as weapons," he fired. "During this period of time, the Council has adopted 12 resolutions against terrorism. Not once were the lives of Israelis murdered by terrorists recognized by this Council. The facts don’t lie. The Security Council has been hypocritical when it comes to Israel." Danon went on to condemn ongoing Palestinian incitement, and recounted in detail before the council the brutal murder of Dafna Meir - an Israeli mother of six and nurse who was stabbed death last week in front of her children by a 15-year-old Arab terrorist. During his interrogation, the murderer told investigators that he had been inspired to carry out the attack by propaganda clips broadcast regularly on the Palestinian Authority's official TV station. "The root of the recent wave of terror is Palestinian incitement," Danon declared, listing the PA's direct encouragement and glorification of terror - at European taxpayers' expense. Among other things, Danon noted how the PA pays families of terrorists, awards honorary degrees to terrorists who murder women and uses toys as tools of incitement. The Israeli UN envoy lashed out at the "hypocrisy" of the Security Council, in condemning terrorism everywhere else in the world, while ignoring terror when it targets Israelis. "Every day, the cruel hand of terrorism strikes somewhere in the world, killing more innocents, destroying more families, and undermining more communities," he said. "As this new Council assumes the grave responsibility for maintaining global peace and security, it must present a united front against terror. "Yet, the international community has made one, only one exception. There is one place in the world that this absolute ban on terrorism can be ignored. Once again, the state of Israel is singled out, and treated differently from all other nations in the world. "During the past four months, Israelis have been stabbed in their homes, shot at in the streets, and run over by terrorists using cars as weapons. Over the course of this wave of violence, thirty people have been killed, and hundreds have been injured. "During this period of time, the Council has adopted twelve resolutions, twelve, against terrorism, and condemned terrorist attacks in France, Sinai, Lebanon, Mali, Tunisia, Turkey, Iraq, Syria, Nigeria, Burkina Faso, Somalia, and Sudan. Not once were the lives of Israelis murdered by terrorists recognized by this Council. "No condemnation, no expression of solidarity, not even a statement of concern. The facts don’t lie. The Security Council has been hypocritical when it comes to Israel." Danon also outlined to Security Council members the current threats posed to Israel by Hezbollah, ISIS and Hamas, and detailed Hezbollah's active preparations to attack Israel from southern Lebanon, including by converting Shia villages into de-facto military bases.